♥Amazing Pack of 3 at a Great Price! 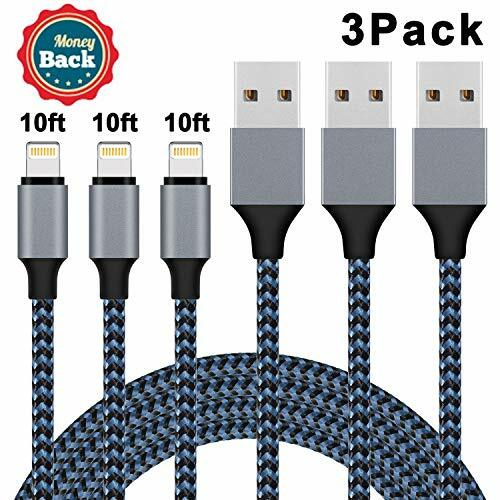 ►Trustworthy Quality: Lightning cable, highly elastic and heat resisting, tested to withstand more than 5000 bends, is durable enough for daily use. ►Fast Charging:iPhone charger ,faster charging speed and stably syncing with high efficiency on your lightning devices to save more time for you. ►New-Style iPphone Cables: 3 Pack of durable, affordable and well-constructed cables. The nylon braided jacket will bring you with unique user experience. ►Super Convenience: 10ft (3M) length is enough for various needs in home, car, office, travel and more, easily bent into small circles for storage. ►5-Star Guarantee: 12 Months Carefree Extended Warranty, Responding to your message within 24 hours. If you have any questions about this product by WEKNLW, contact us by completing and submitting the form below. If you are looking for a specif part number, please include it with your message.